Late Production with 60lb Rockets. US-built WWII era Canadian Army heavy 4x4 armored car. 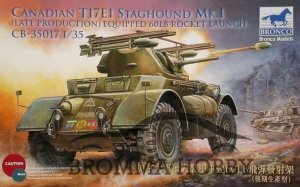 Kit features highly detailed exterior with photo-etch parts, separately molded hatches and on-vehicle equipment, turret with interior and external rocket launch rails with (x4) 60lb rockets plus M6 37mm AT main gun complete with detailed breech and metal barrel. Decals and painting reference for a single vehicle of the 12th Manitoba Dragoons, II Canadian Corps Armoured Car Regiment, Belgium, winter 1944. Produkten lades till Sunday den 22 July, 2012.